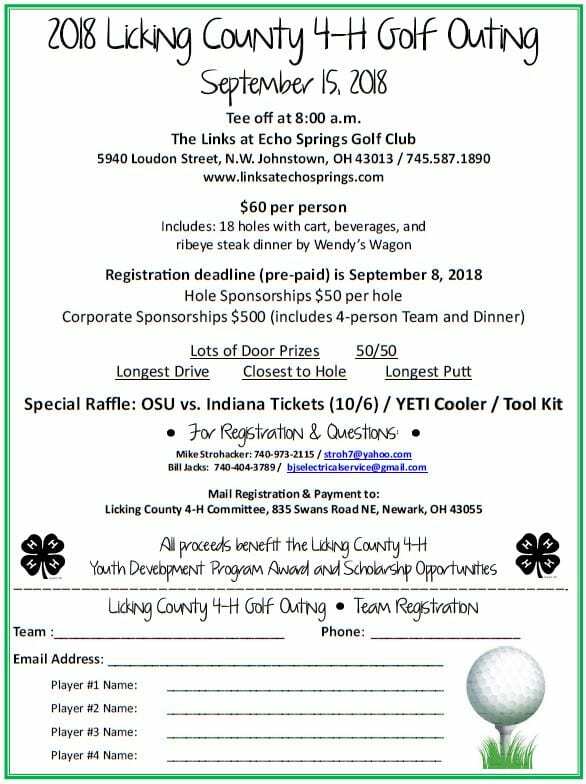 We are still looking for groups interested in golfing at the 2018 Licking County 4-H Golf Outing on Saturday, September 15th at The Links at Echo Springs. Interested parties should contact Mike Strohacker at 740.973.2115/stroh7@yahoo.com or Bill Jacks at 740.404.3789/bjselectricalservice@gmail.com. The deadline to register is Saturday, September 8th. All proceeds benefit the Licking County 4-H Youth Development Program Award and Scholarship Opportunities. 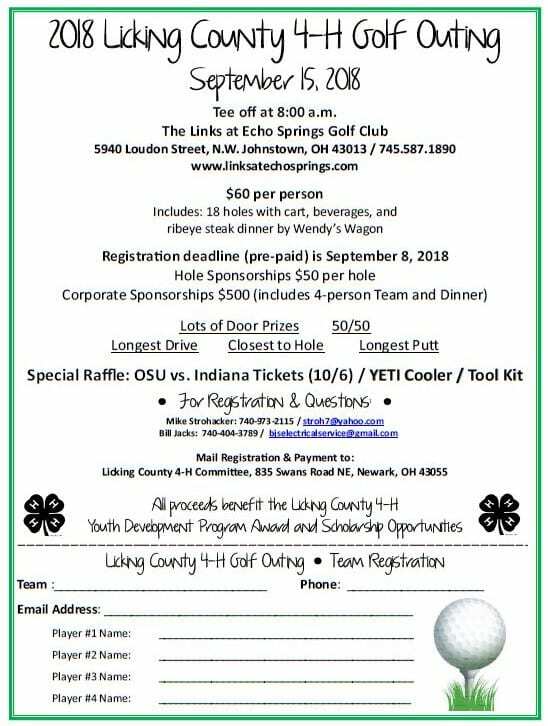 The Licking County 4-H Committee will hold its annual golf outing on Saturday, September 15, 2018 at The Links at Echo Springs Golf Club. The committee is still looking for sponsorship, door prize donations as well as those interested in golfing that day. Please find additional information below. The 4-H Committee is also selling raffle tickets for OSU Football Tickets, a Yeti Cooler and a Tool Kit. If you are interested in purchasing tickets, please contact a 4-H Committee Member (complete list can be found at: https://licking.osu.edu/program-areas/4-h-youth-development/4-h-committee). 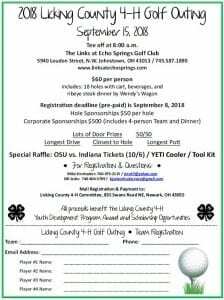 All proceeds from the golf tournament and raffle will go to help the Licking County 4-H Program with sponsorship for trips/camps/scholarships, supplies, awards and other items necessary to help our program run. The Licking County 4-H Committee will be hosting a Magic: The Gathering tournament of Saturday, May 19th at the Ohio 4-H Center on the OSU Columbus Campus. The 4-H Committee uses the funds from these fundraisers to help support the Licking County 4-H Program by providing Camp Scholarships, Award Sponsorship, Trip Sponsorship as well as many other forms of support to the program. Registrations must be postmarked by April 30th.